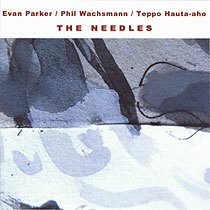 Evan Parker, soprano and tenor saxophones; Phil Wachsmann, violin; Teppo Hauta-aho, bass. Disc 1 was recorded live at the 9th International Kerava Jazz Festival at Keuda House, Kerava Hall, Finland on 10 June 2000; disc 2 was recorded at Gateway Studio, London on 5 April 2001. Front cover artwork (reproduced above) From chalk cliffs sequence by Catherine Hope-Jones.